This is one challenge I just have to join because I am part Irish after all and have the Irish temper to prove it. :) It will fit in well with some of my other challenges - Historical, Reading Western Europe and New authors. You can join in anytime. The books can apply to other challenges. Books that apply - written by an Irish author, set in Ireland, or involving Irish history or Irish characters. I'm going for broke, since I've always wanted to kiss the Blarney Stone (my grandmother did) and do it metaphorically by joining the Kiss The Blarney Stone Level and read 6 books. Thanks to Carrie, I just won a copy of "An Irish Country Doctor" by Patrick Taylor so it will be one of the books I'll be reading. After looking up Frank Delaney and checking out his books on Amazon, I've fallen in love, so will be reading "Ireland: A Novel." Coincidentally, I've been offered the chance to join in on the TLC book tour of Delaney's Venetia Kelly's Traveling Show. An offer I just can not pass up, so will be reading that one as well. Bram Stoker is Irish, did you know that? I'll be checking out his book "The Snake's Pass." Also will be re-reading "QB VII" by Leon Uris. I haven't figured out the last book yet, but if you have any suggestions, please let me know. 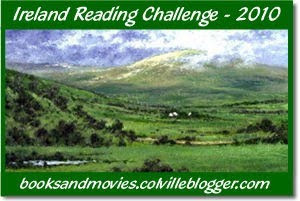 Come join the Ireland Reading Challenge with me and may the luck of the Irish be with you! It sounds like a very interesting and fun challenge! Great! Thanks so much (oozing with sarcasm). Now I'm off to join yet another challenge. I love an Irish setting. Sigh. I'm so glad you're joining us! I am signed up for this one too and so excited! I am doing the Kiss the Blarney Stone level too - I did kiss the blarney stone as a child - I should dig out that picture . . . This sounds like fun! First on my list is a reread of Thomas Cahill.